NAGLREP's first-ever Housing Policy Summit took place this week in Washington, D.C.
Days before the summit, United States Congressmen David Cicilline (D-RI), co-chair of the Congressional LGBT Equality Caucus, and Scott Taylor (R-VA) introduced two bills promoting LGBTQ housing equality. NAGLREP says it will continue to fight for the rights of the LGBTQ community and plans to use its upcoming conference as a way to garner more support. On Tuesday, The National Association of Gay and Lesbian Real Estate Professionals wrapped up its first-ever Housing Policy Summit, which gathered well-known LGBT and allied housing leaders from the U.S. Department of Housing and Urban Development (HUD), the National Association of Realtors (NAR), the Human Rights Campaign (HRC) and the National LGBTQ Task Force to pinpoint issues and craft legislation to better gird the LGBTQ community going forward. In a previous interview, NAGLREP founder Jeff Berger and NAGLREP Policy Committee Chair John Graff said they felt compelled to kick-start the summit because of the risk of losing the ground the LGBTQ community has made in recent years, such as gaining marriage equality and other housing and employment protections. “The Housing Policy Summit is an important step to ensure that federal fair housing laws include LGBT protections and HUD continues to recognize the importance of LGBT concerns,” said Graff in a statement. Four days before the summit, Congressman Scott Taylor (R-VA) submitted HR 1447, a bill that aims to “extend protections of the Fair Housing Act to persons suffering discrimination on the basis of sexual orientation and gender identity” — something that doesn’t exist in the current version of the bill. “Generally in the past this has been more of a Democratic issue, and one that you would see from what people call ‘the coastal liberal,’” Graff said. He says equality shouldn’t be a partisan issue. “He put it best: ‘This is just a matter of fairness. Plain and simple,'” Graff added. During his keynote address, Congressman David Cicilline also mentioned that he’s re-introduced the Equality Act, which would prohibit discrimination against the lesbian, gay, bisexual and transgender community in public accommodations, housing, employment, federal funding, education, credit and jury service. “It was a monumental day in the 10-year history of NAGLREP to have such critical discussions with two esteemed members of Congress,” said Graff, who is also a Realtor with the John Graff Group in Los Angeles, in a press release. How big an issue is discrimination? Berger says the submission of HR 1447 and the re-introduction of the Equality Act are essential in combating the discrimination LGBTQ buyers and renters face as they seek housing. Although there aren’t many LGBTQ housing discrimination cases due to the fact that it can be hard to prove that someone was denied housing because of their sexual orientation or gender identity, Berger says a recent NAGLREP survey shows that this community is very concerned about this issue. 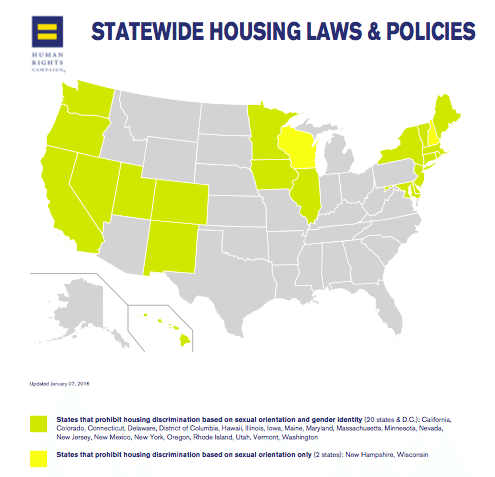 According to the HRC, only 20 states have housing protections for the LGBTQ community — something Berger says NAGLREP will fight to expand hopefully with the help of NAR and Housing Policy Summit sponsors Wells Fargo Home Mortgage, Union Bank, Freddie Mac and Long and Foster Real Estate, all of whom received a letter this morning asking for continued support. In the meantime, Graff says they’ll be using NAGLREP’s National LGBT Real Estate Conference as an opportunity to mobilize LGBTQ professionals and allies and encourage them to become politically involved by reaching out to their elected officials and becoming co-sponsors of the HR 1447 and Equality Act bills. “NAGLREP has an important role to work with such distinguished members of Congress and we recognize we are living in uncertain times and were reminded during the Summit how important it is for all us to share our views with our national and state leaders,” he said in a statement.